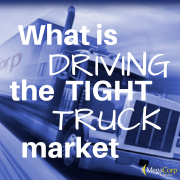 The main factors affecting the truck market in the second quarter are the Road Check, ELD Mandate, produce season and driver shortages. 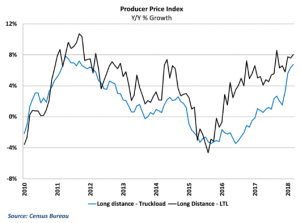 Additionally, rising fuel prices and the increasing load-to-truck ratio will have a heavy impact on the market in the summer months of 2018. The Commercial Vehicle Safety Alliance’s (CVSA) International Roadcheck is June 5-7, 2018. Over that 72-hour period, commercial motor vehicle inspectors throughout North America conduct inspections of commercial motor vehicles and drivers. During Roadcheck 2017, more than 14 trucks or buses were inspected, on average, during every minute of the 72-hour event. That’s over 840 inspections per hour. “The top reason drivers were placed out of service during 2017 International Roadcheck was for hours-of-service violations,” said CVSA President Capt. Christopher Turner of the Kansas Highway Patrol. “Thirty-two percent of drivers who were placed out of service during last year’s three-day International Roadcheck were removed from our roadways due to violations related to hours-of-service regulations. It’s definitely an area we need to call attention to this year”(Source: J. J. Keller & Associates, Inc). “Although the Electronic Logging Device (ELD) rule that went into effect on Dec. 18, 2017, does not change any of the underlying hours-of-service rules or exceptions, the ELD mandate placed a spotlight on hours-of-service compliance,” said Capt. Turner. “We thought this year would be a perfect opportunity to focus on the importance of the hours-of-service regulations. This is why the emphasis area at this year’s Roadcheck is hours of service. Officers will be downloading drivers’ electronic logs, when possible, and checking for compliance. If a minor violation is discovered, the carrier is given 15 days to complete the repairs and to sign and return the report. If the driver’s violation is serious enough, they can immediately be placed out of service for up to 10 hours. If the vehicle is placed out of service (instead of or in addition to the driver), the vehicle must either be repaired where it is or towed directly to a repair facility before being able to move. Trucks will be tight and expensive the week of the roadcheck, as some carriers decide to pull their trucks off the road to avoid inspection. This puts a larger strain on the market, contributing to inflated rates due to supply-in-demand. Despite the tame monthly results in March, trucking inflation remains elevated. Year-over-year growth in long distance truckload prices pushed to a fresh six-year high of 6.8% in March. Yearly inflation in the LTL space also climbed during the month, remaining near 8% in March (Source: Freightwaves.com). Details from the Producer Price Index (PPI) report from the Census Bureau suggest that other modes of transportation are seeing rising rates. Intermodal rail freight rates have climbed rapidly. PPI data for intermodal rail has surged over the past couple of months and climbed a whopping 4.5% in March from February’s levels. Intermodal prices are now over 13% higher than at this point last year, a sign that some of the pricing pressure from the trucking industry might be spilling out into other modes of transportation (Source: Freightwaves.com). Fuel prices continue to rise and there is no telling when they will stop. At this time, prices are 22% higher than they were last year; an increase of $.70 over last year. Prices are expected to climb until they hit $3.50 by the end of the year (Truckstop.com). There are about 6.6 loads for every available truck trailer, according to DAT Solutions, which tracks freight and rates. According to Trucks.com, a year ago there were 3.5 loads per every van. The larger imbalance this year gives truckers and motor carriers the ability to negotiate higher fuel surcharges and rates to cover rising expenses. Motor carriers charged customers a fuel surcharge of $0.31 per mile last month, up from $0.24 a year earlier. Meanwhile, according to DAT, the spot trucking rates for a standard trailer have risen 29% to $1.85 per mile from a year ago. The ELD mandate was expected to reduce driver productivity anywhere from 3-10% (source: FSA) because drivers need to stay within the hours-of-service (HOS) limits. A run that previously could have been squeezed into one day now may take two days, which will translate into additional costs and delays for shippers. 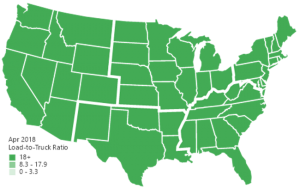 DAT Solutions recently conducted a survey, and of the carriers currently running ELDs, more than 70% reported that they are earning less money now than they were prior to implementation. Correspondingly, 87% of respondents indicated that the ELD mandate changed the way they choose loads. This is because they are restricted to driving fewer miles since installing ELDs. If possible, have a space reserved for trucks to park when they run out of hours. Truck parking has already become an issue and will only continue to get worse. Know the closest safe place for trucks to park (Wal-mart, Sam’s Club, rest area, etc). 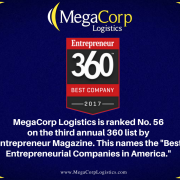 Expand shipping and receiving times. Load and unload as efficiently as possible. 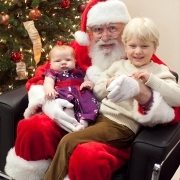 Review and update your detention and/or layover policies. The produce season started off strong in the Southeast fruit markets due to the warm, dry conditions, but that changed quickly with the unseasonably early tropical depression. The heavy rains in the Southeast have delayed harvesting. 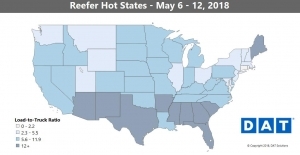 Capacity will be extremely tight in Georgia, the Florida Panhandle, Alabama, Mississippi, South Carolina and Eastern North Carolina as soon as they are allowed to harvest after the area dries out. 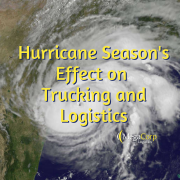 Due to the amount of produce coming out of Texas, in addition to the year-round freight out of that area, Texas is experiencing high truck rates and tight capacity. Cotton out of Arkansas will be ready for harvest in late June adding strain to that area. Arizona truck rates have been expensive due to tight carrier capacity throughout produce season this spring. With Arizona currently winding down, we should see a full transition to the California produce season after July 4th. 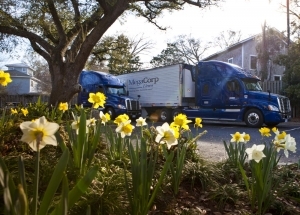 Similar to Arizona, California is experiencing a strong growing season state-wide and the outbound trucks outnumber the inbound trucks creating a spike in shipping costs. Adding more strain to the market, apples and cherries will be ready to harvest soon out of Northern California, Oregon and Washington because the temperatures have been above normal, speeding up their harvesting season. Therefore, the Pacific Northwest will see an influx of trucks and an increase in pricing. How can shippers help? Give as much notice as possible to your logistics provider about upcoming shipments. This will allow your provider to secure truck capacity and should lower freight charges. According to the Food Shippers of America (FSA), the labor Market added more than 313,000 jobs in February 2018 which is the strongest gain since July 2016. 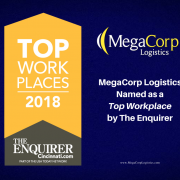 While that’s good news for job seekers, it’s not good for the trucking industry because drivers are leaving the road for better-paying opportunities and more desirable hours. 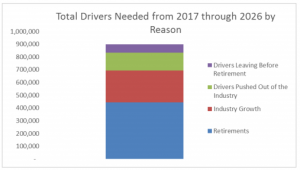 Some of the factors that are contributing to the truck driver shortage include: “Competition within the industry and from other industries; driver qualifications and requirements; workforce demographics; regulations that tighten capacity; and difficulty attracting young people to the industry since one cannot acquire a commercial driver’s license (CDL) until age 21” (DC Velocity). 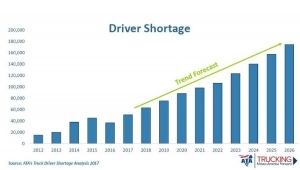 Currently the driver shortage is estimated at around 50,000 drivers, and could skyrocket to 898,000 drivers in the next decade if consumer confidence and economy continue to grow at their current pace (Source: ATA). We have seen carrier pricing stabilize in March and April. 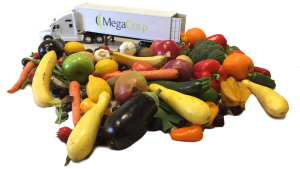 However, due to the upcoming summer months/produce season, we are already experiencing a tighter truck market. We expect the market to continue to tighten through the summer months. MegaCorp’s focus this summer is to continue building strong carrier relationships by reloading our primary carrier base. This will enable us to keep our customers’ freight rates below the national average. 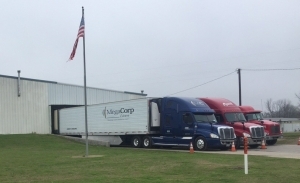 By reloading our primary carriers, not only will we provide exceptional service, but we will be able to offer our clients truck capacity in tight regions throughout North America. For a quote, please CLICK HERE. 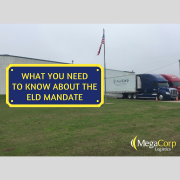 Electronic Logging Device: What is the ELD Mandate?